I don’t have all the answers. Never pretended to. But I thought I mostly had things figured out, you know? Like I had a pretty good grip on things, knew how to handle myself and get around. But I don’t recognize reality anymore. Not when a late 1990s Honda Civic Si can sell for as much as a new one, or an Acura Integra Type R can command a sale price of almost $45,000. Don’t believe me? Check out this sale listing at Washington’s Boyko Motors, which has the no. 35 of 320 ITRs for sale at $44,990. Let me be clear that this is a great example of Honda’s late 1990s/early 2000s performance legend. It’s a 1997 model with just one owner and only 14,423 miles on the odometer. It’s clean as hell, inside and out. And I’m also not downplaying the significance or the awesomeness of the Integra Type R. Long the only Type R sold in America, this Integra was known for its screaming 8,000 RPM redline, VTEC shenanigans, and handling that put it on par with even newer exotics and high-end performers like the C6 Corvette ZR1. It’s a special machine, and rare to boot. In case you’re curious, this is a decent amount more expensive than most Integra Type Rs (Integras Type R?) we’ve seen sold lately. A cursory search over at Bring a Trailer reveals most of the best ones go for around $30,000, max. Many others have sold for quite a bit less than that, though one recent outlier sold for $40,000 in November. Maybe it was a preview of what’s to come. 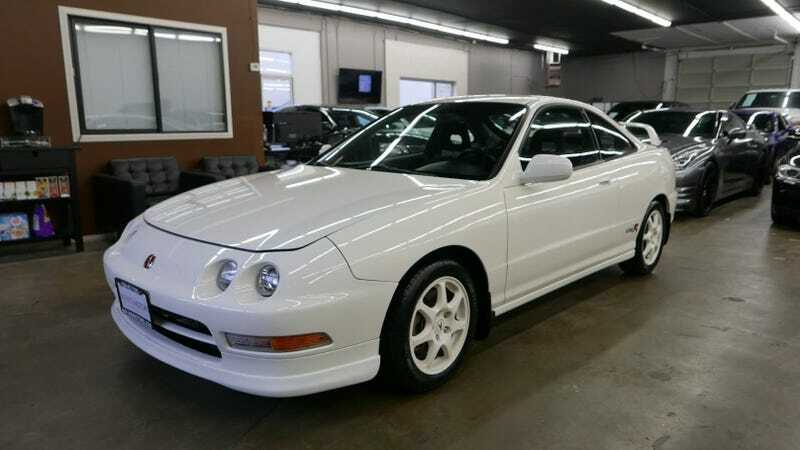 Anyway, this is a very nice and good Integra Type R. If you have almost $50,000 you should buy it, but please drive it as it is meant to be driven and stop telling me how expensive the cars I grew up loving are now, because it makes me feel old.